"Spike's my hero, because he's so big and strong!" The geeky comic relief character who worships the hero and whose primary purpose is to stand around and marvel at every thing the hero does, explaining exactly why it should be so impossible. The Hero Worshipper is usually the one who explains the plot to a less intelligent hero. He rarely has much power of his own, if any, and sometimes is an even bigger This Loser Is You character than the hero. Often works as a stand-in for the audience, sometimes in the way of a American sidekick - but with a few notable differences. May also be a Combat Commentator or Mr. Exposition. Compare Irritation Is the Sincerest Form of Flattery (if this character goes too far in an innocent way), Loony Fan (if he goes too far in a less-innocent way), Even Heroes Have Heroes (if the worshiper becomes a hero himself). Isidro from the Berserk manga admires Guts to the point of wanting to copy Guts' fighting style, until Guts tells him that things like different height and speed would make BFS wielding for someone as small as Isidro nearly impossible. Farnese's unrequited crush on Guts usually takes the form of a slavish craving for his approval, and she is often brought to the point of Tears of Joy by any kind word from him. Thoroughly subverted in Bleach with Soifon, who was seen to worship Yoruichi way too much before said mentor left without a word, leaving the devastated ninja girl to attempt to kill her during the storyline. Subversion supported by the fact that Soifon holds rank as a Captain in Soul Society, and is thus a very competent combatant. Daidouji Tomoyo of Cardcaptor Sakura. Krillin in later chapters of Dragonball Z.
Naomichi Yamada from Hajime no Ippo started out as Ippo's biggest fanboy, then joined Kamogawa Gym to improve himself and be closer to his idol. Robert E.O. Speedwagon in Part 1 of JoJo's Bizarre Adventure. Subverted in Katekyo Hitman Reborn, where Gokudera worships the ground that Tsuna walks on, but is quite capable at fighting himself. Everyone that Misaki's ever beaten in Kidou Tenshi Angelic Layer becomes her Combat Commentator and squealing fan, even those who would rather not admit it. Subaru Nakajima from Magical Girl Lyrical Nanoha towards that title character. With the amount of Shout Outs the series does, one wonders if her fair resemblance to Street Fighter's Sakura was intentional. Kensuke in Neon Genesis Evangelion fits this trope to a T.
Koby in the initial arc of One Piece. Professor Kid from Obake No Qtaro. Futaba from Puni Puni Poemy serves as a parody of this trope. Joshua Christopher from Chrono Crusade is an odd twisted example. He's incredibly devoted to Aion and often speaks about him in glowing terms, and is very excited when he gets a chance to watch him fight. The thing that makes this twisted is (a) Aion is the Big Bad; (b) Joshua has been given incredible power by Aion in order to do his bidding, and (c) that power has turned him absolutely bonkers. He would maybe be a Loony Fan if it wasn't that Aion was the one that drove him nuts in the first place and doesn't actively discourage him. Baccano! : Graham is pretty much convinced that Ladd is the second coming of Christ. Gau from Nabari no Ou's devotion to Raikou is so strong that he's willing to commit suicide if he thinks it'd make Raikou happier. Kaorin is a bit of this to Sakaki in Azumanga Daioh. Part of it's just Single-Target Sexuality, but she also does a fair bit of expositing on just how cool and athletic Sakaki is. In Fate/Zero, Waver Velvet eventually becomes this to his Servant Rider, saying that he would follow the latter without hesitation and, to Gilgamesh, proudly declared himself to be Rider's follower rather than Master. He even keeps all of his Servant's video games as a memento and wears his colors when he becomes Lord El-Melloi II. In Record of Lodoss War, Parn hero-worships Kashue very very much. Eddie Bloomberg aka Kid Devil from the DCU used to worship Blue Devil, even in the earliest days of his hero career. Apparently, hero-worshipping Optimus is a recognised Cybertronian personality disorder known as "primus apotheosis". There are even Decepticons who suffer from it. Bat-Mite worships the ground the Dark Knight stands on, despite (and because of) the fact that he's basically a god and could obliterate Batman with a thought (while Batman is a mere mortal who isn't intimidated by this for one second). The Kid from The Matrix. Buddy to Mr. Incredible of The Incredibles, initially. Crosses over to Loony Fan territory eventually. Colin Creevey from Harry Potter. Wormtail during the Marauders' days. In poorly written adaptations of Sherlock Holmes, Dr. Watson is portrayed in this fashion. Owen of Jesslaw, in Tamora Pierce's Page, is an instant groupie of Keladry. In Sammy Keyes and the Wild Things," Sammy is somewhat unnerved to learn that her classmate Cassie Kuo has been eagerly watching her exploits all year, rooting for her against her Arch Enemy Heather, and basically enjoying Sammy's life as a soap opera. J.D. from Scrubs somewhat falls into this when it comes to Dr. Cox. He even admits himself that he is "prone to hero worship". However, he's not incompetent by any means. Despite being an obvious Fan Girl of his works, Detective Kate Beckett is not this to Richard Castle, being his equal (and superior) in many ways and more likely to puncture his slightly-too-healthy ego and opinion of himself with snarky quips than anything else. Instead, this trope falls to Detective Kevin Ryan, who seems to have taken Castle on as something of a mentor. Suikoden II had that kid in Banner Village, who worshipped not one, but two heroes. Namely, Tir, the hero of Suikoden I, and Riou, the hero of Suikoden II. He's instrumental to getting Tir into your entourage. Cyrano: Well, what saw you, then? Ragueneau: That in the Burgundy Hotel, 'faith! Cyrano (contemptuously): Ah!. . .the duel! Ragueneau (admiringly): Ay! the duel in verse!. . .
Lise: He can talk of naught else! Cyrano: Well! Good! let be! (He straightens himself): ...Oh! to write a ballade! The third game reveals those photos and autographs he claimed he wanted in the first game to show his wife? Yeah, she doesn't actually exist. He does have a shrine to Shepard though, but they shouldn't worry, its all done very tastefully. Intentionally played for evil laughs with the Adoring Fan in The Elder Scrolls IV: Oblivion, who starts following you around doing nothing but babble about your greatness after you become the Grand Champion of the Arena. The guy was apparently so annoying that players compete with each other in brutality of the ways to kill him (and he always respawns, too). Here's an example. Alyx Vance, along with being Gordon's sidekick, becomes this during Half Life 2: Episode One, commenting on Gordon's extraordinary feats. Shingo Yabuki in the King of Fighters series. The parallels between him and Sakura Kasugano (see below) (who debuted around the same time) are so strong he might be a Distaff Counterpart. Alex from Lunar: Silver Star Story Complete is a worshipper of the Dragonmaster Dyne. However, the trope's completely inverted in that Alex is the main character and actually gains the chance to live out his dream. Otacon in the first Metal Gear Solid, but he's very much a deconstruction of this too. Meryl was like this initially when she realized who the jerk that insulted her was. One of Mei Ling's first lines was her expressing delight at "being hit on by the famous Solid Snake." Sakura Kasugano in the Street Fighter series is this to her mentor Ryu. Dallas, a prisoner from The Suffering to the hero Torque. Yes, admiring the guy who saves you from monsters is natural, but... It's notable in that genuine good emotions, like friendship and loyalty are darned hard to come by in the setting, due to Plot Reasons. Latter partners in the game are notably crazy-pants. Dallas is also notable for being comfortably bisexual. Luther would also count, having regressed to a childlike state in all the panic and chaos of the plot. At one point, he actually decides that Torque must be "an Angel of Vengeance come to save us all." How sweet. Spiderman to Batman in Marvel/DC After Hours and Happy Hour. He was like this to Superman too back in the day. And Goblin has this going for Willem Defoe. Cooper in Ben 10 Alien Force...but worships The Chick. Deconstructed in the Justice League episode "Legends", with Ray Thompson. It turns out that Ray is a Reality Warper who couldn't cope with the fact that the Justice Guild were killed in battle, and has effectively turned the entire city into his own personal Lotus Eater Machine. Also from Looney Tunes, the page picture comes from a pair of cartoons, Tree for Two and Dr. Jerkyl's Hide, in which Spike/Alfie the Bulldog is hero-worshiped by Chester the Terrier. 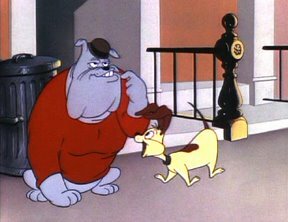 Their relationship is inverted after a series of humiliating defeats is inflicted on Spike, and he ends up hero-worshiping the smaller dog. Subverted with Lugnut in Transformers Animated. He's practically a one-mech Megatron cult to the point where even Megatron gets sick of his constant loud praises, but he's also the largest and strongest member of the Decepticons on Earth and his "Punch of Kill Everything" is not named ironically. Enzo Matrix in Re Boot admired Bob the Guardian when he was a little sprite in the first two seasons. In the fourth season, the grown-up Enzo (Matrix) finds himself the target of admiration from... Enzo Matrix (it's a long story). Younger Enzo eventually learns to stop imitating his grown-up self and become his own Sprite. Jackie Chan Adventures had Paco embodying this trope in regards to El Toro Fuerte. Granted, his worship waned when he found out the secret of his hero's strength, but it was soon revitalized, and he followed El Toro just about everywhere he went. To a similar extent, Jade was often Jackie's loudest cheerleader, and once stated she wanted to be "a female Jackie Chan" (even though, technically, she was saying that after seeing Viper in action). Irving from Phineas and Ferb worships the titular duo to the point of dressing up like them, sneaking into their mom's car so he can go to the beach with them, and takes pictures of their exploits (one of which was eating some soup). Even Bollywood Nerd Baljeet thinks he's an embarrassment. Scootaloo from My Little Pony Friendship Is Magic idolizes Rainbow Dash. As far as she is concerned, Rainbow Dash is the best pony. Kim Possible was the object of hero worship from her younger cousin Joss Possible. By the end of the story, she began to see Ron as a hero instead, since Kim shrugs off the dangers she faces easily, while Ron has to conquer his fear to fight alongside Kim. This page was last edited on 15 October 2015, at 19:04.